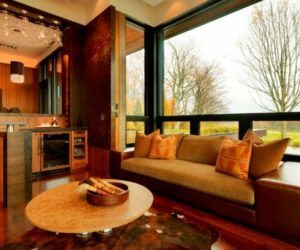 At first, large interior walls seem like a gift – so much space! 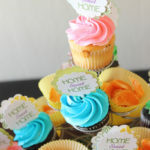 The sky’s the limit in decorating them, right? Not always. 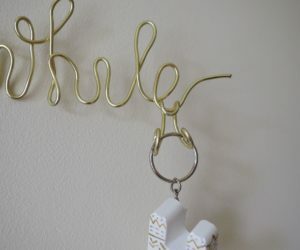 In fact, it’s a design gift to be able to style a large wall just right, with proportions, connections, and white space all thoughtfully considered. 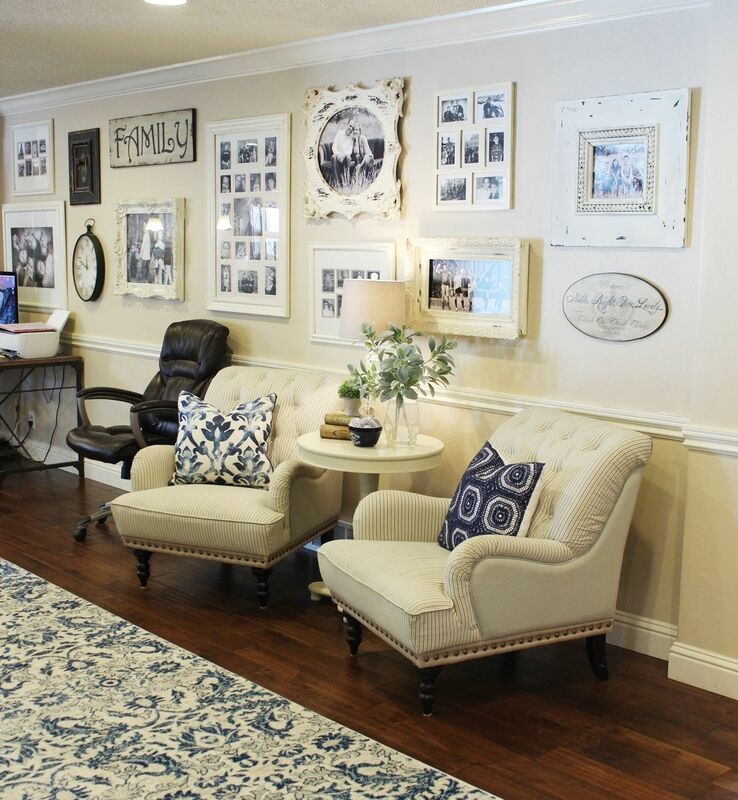 Here is a look at several ideas for how to decorate a large wall with style. 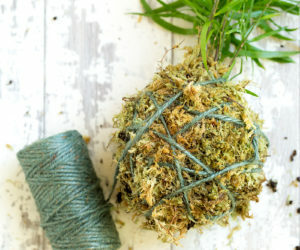 You might be surprised at how simple it can be. 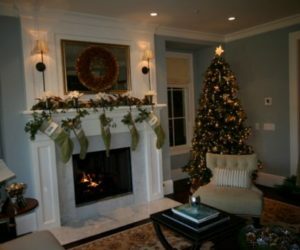 If your large wall happens to fall between two perpendicular side walls, you might find that the best way to “decorate” the large wall is to get some use out of it. 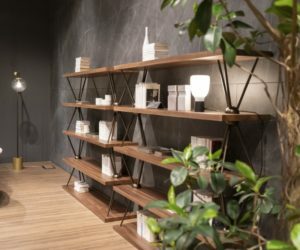 Built-in shelves not only add functionality to your space, but they also provide instantaneous opportunity for décor as well as increase the value of your home. 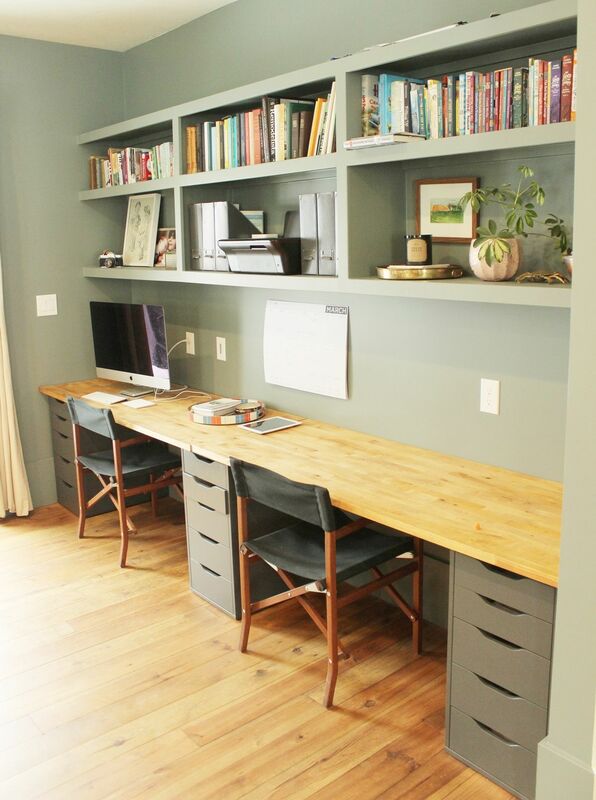 A desk on the lower half of the large wall increases usability even more. Emphasize the architecture by painting a contrasting color on the back wall of your built-in shelves. 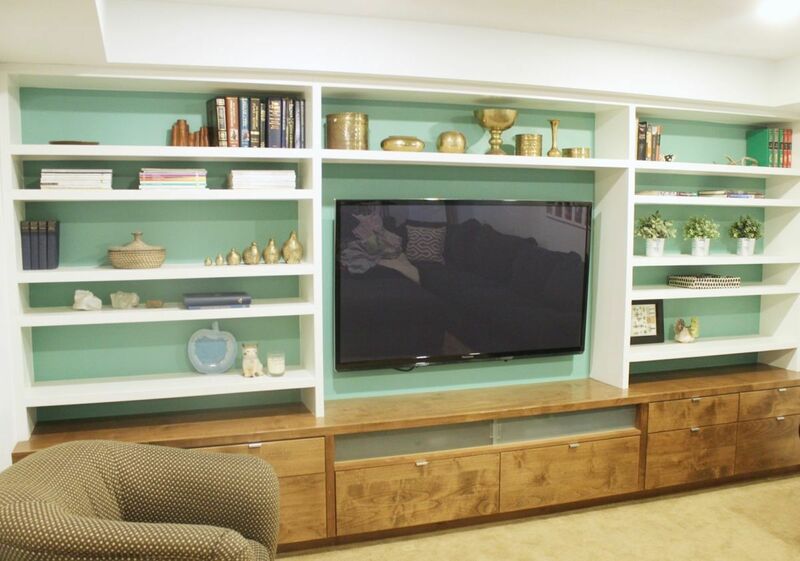 This not only adds great color to the space itself, but it also showcases the shelving. When the shelf/back colors are greatly contrasted (white and black being the most significant in contrast), the visual effect will be inherently striking and “busy,” so be sure to decorate the shelves themselves with a restrained hand. 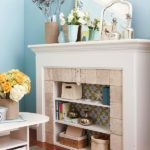 If built-in shelves don’t make sense for your space, such as if you are renting or simply aren’t able to make the built-ins work, you can easily go with Plan B: a large, sturdy bookcase on one side of the large wall, and some artwork in the empty space. 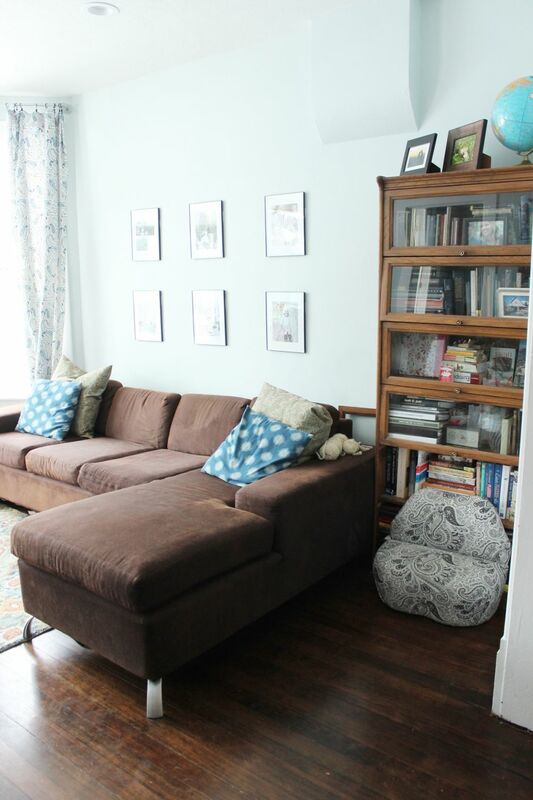 Notice how the sofa is positioned offset-center here, a nice balance of visual weight to the side-positioned wooden bookshelves. 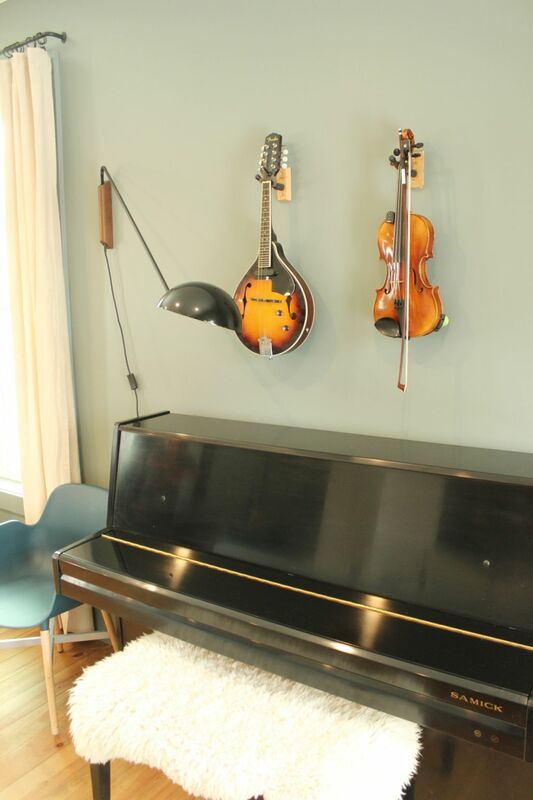 If your large wall happens to fall in the space where music is (a) appreciated, and (b) practiced, it makes sense to have the instruments easily accessible…while keeping them safely off the ground. Mounted instruments look organized and can even pass as 3-D “art” to our senses. 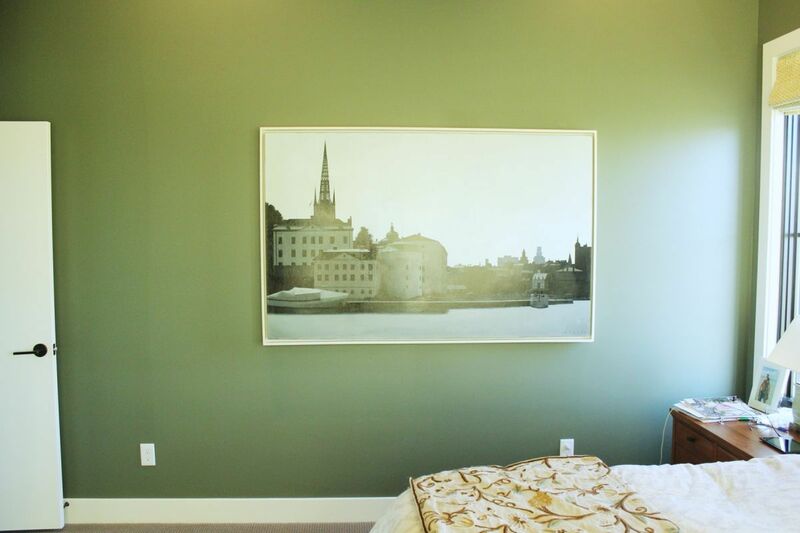 A “large wall” may or may not include windows, doors, or other architectural components. 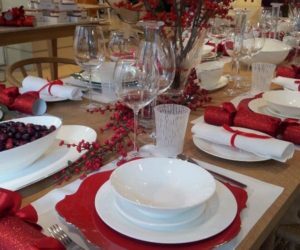 When this happens, consider making those additions part of the room’s overall design by incorporating simple, symmetrical decorations. 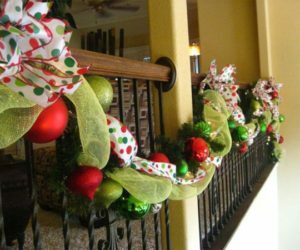 Wreaths hung over windows, for example, provide great greenery and contrast to a light window silhouette. 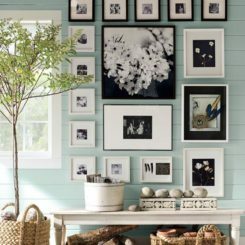 You can also create a sense of symmetry by hanging a line of large-ish photos, paintings, or other art pieces in identical frames along the large wall, in between two windows or doors or whatever else. 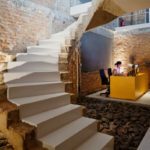 This provides a straightforward connection and brings the potentially overwhelming scope of the large wall down to a manageable, even enjoyable, scale. 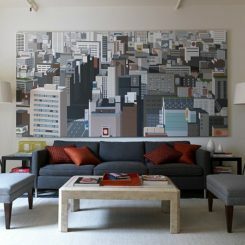 Perhaps the most obvious way to decorate a large wall is to hang a large piece of art on that wall. 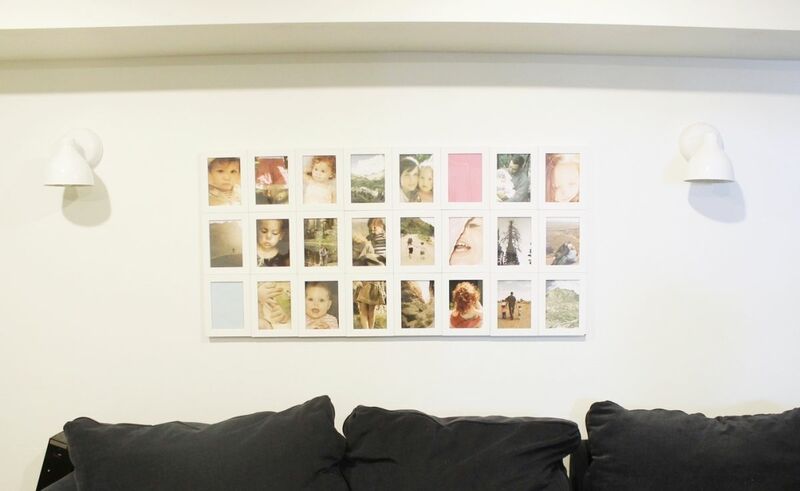 This is an excellent idea, provided that the artwork is, in fact, large enough to hold its own on the wall. If you’re going to err, err on the side of slightly bigger artwork than slightly smaller. 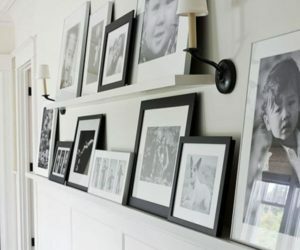 A gallery wall is a favorite method for how to decorate a large wall, because it can be constantly changing, little by little, to accommodate more or bigger or smaller or different artwork without losing itself or becoming obsolete. 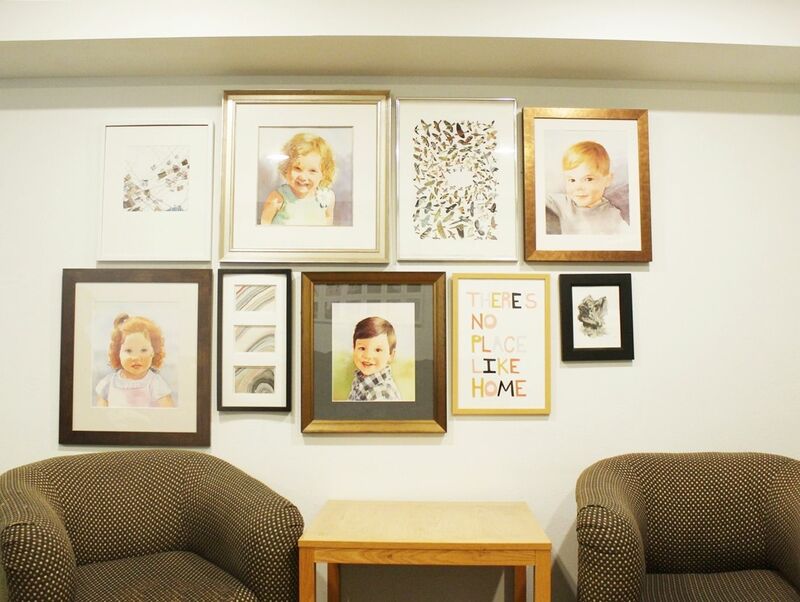 One way to do a gallery wall is to determine the room’s color scheme, and simply choose varying sizes and shapes of artwork and frames that fall within that scope. 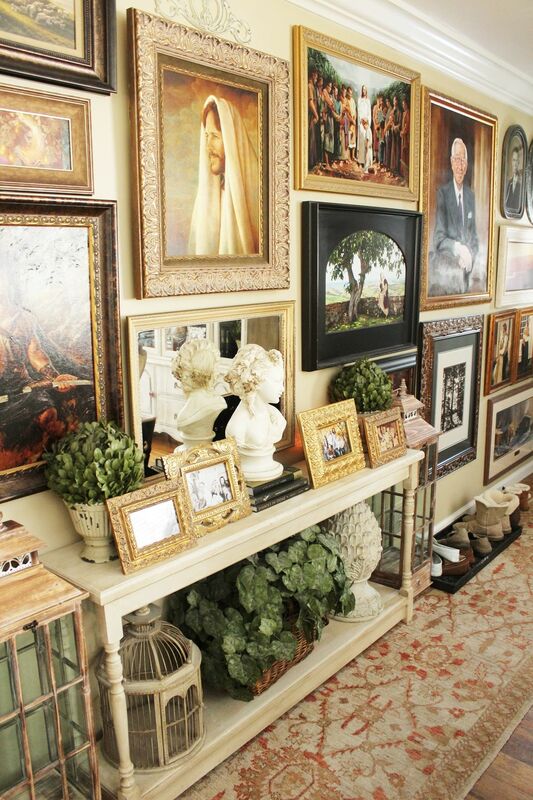 This creates a lovely aesthetic flow from one side of the room to the other. 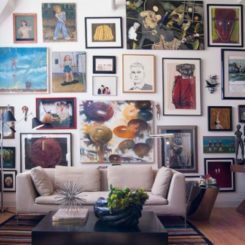 Be sure, whether your wall is very large or just regularly large, that you have enough artwork that you can hang them relatively close together for a greater visual impact; if they are spread too far apart, the gallery wall loses a lot of its appeal. 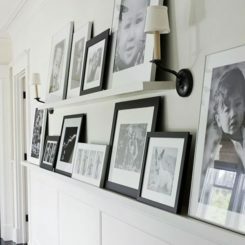 It’s better to have a great gallery wall on a smaller section of your large wall than it is to spread out your artwork simply in an attempt to cover more wall space. 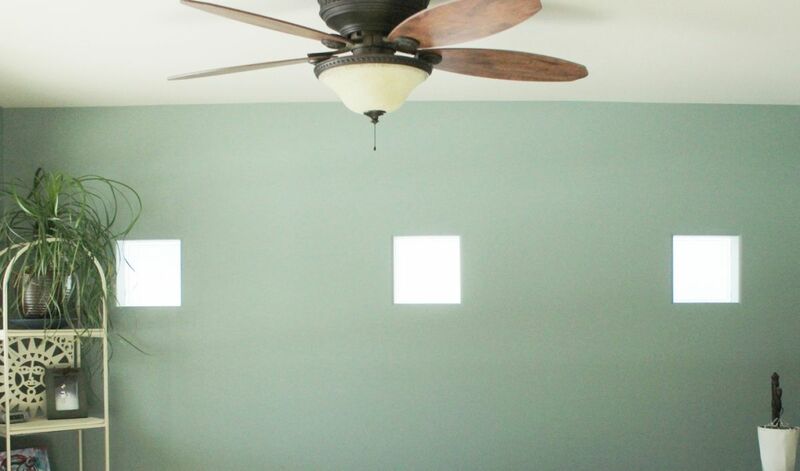 Sometimes, the best thing to do with a large wall is to turn it into a beautiful color, either via paint or wallpaper, and then let it simply be. 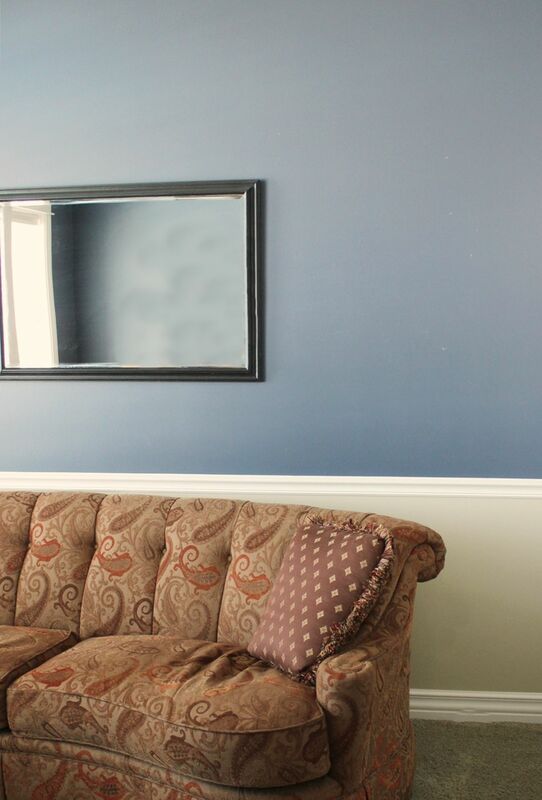 This lovely, warm blue hue is serene and soothing, enhanced by a mirror’s reflection. 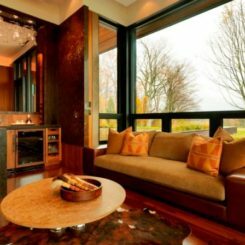 Depending on the age and style of your home, you might have some architectural features built in to your large wall, such as these small glass block windows. 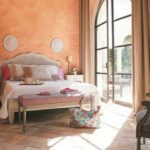 A beautiful paint color on the large wall will go far in embracing the architecture and laying the foundation of tasteful design sensibility. 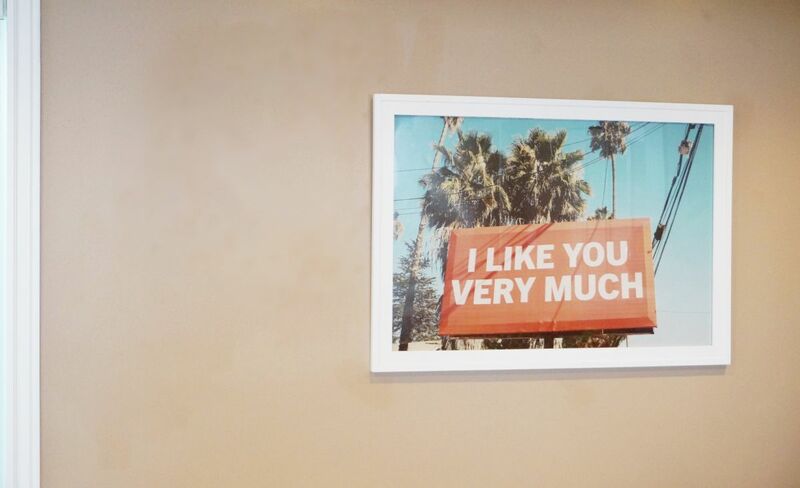 Oversized artwork can come with a hefty price tag. 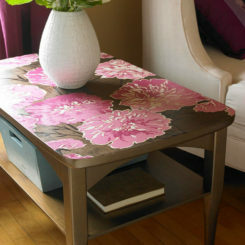 To keep your budget happy, consider clustering a few smaller pieces together to aesthetically “read” as one large piece. 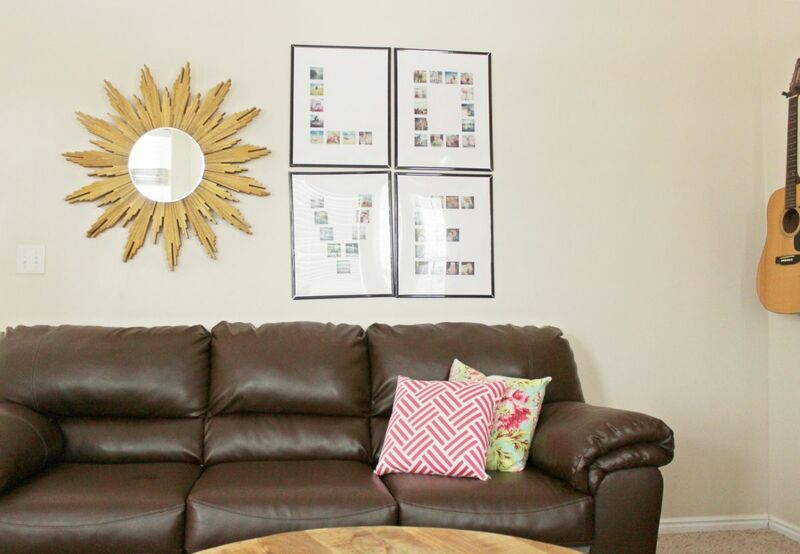 In this framed LOVE grouping, each letter is comprised of 1.5” photo squares, which adds a great personal touch to the artwork, along with an off-centered DIY sunburst mirror. 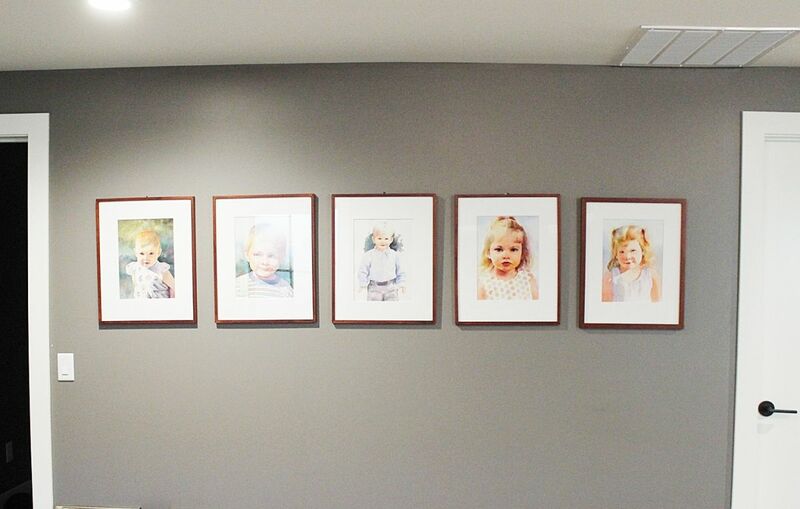 This beautiful display is a set of many identical 5×7 frames, mounted and hung together, to become one single piece to enjoy on a large wall. Keep the photos similar in color tone and even content for best results. 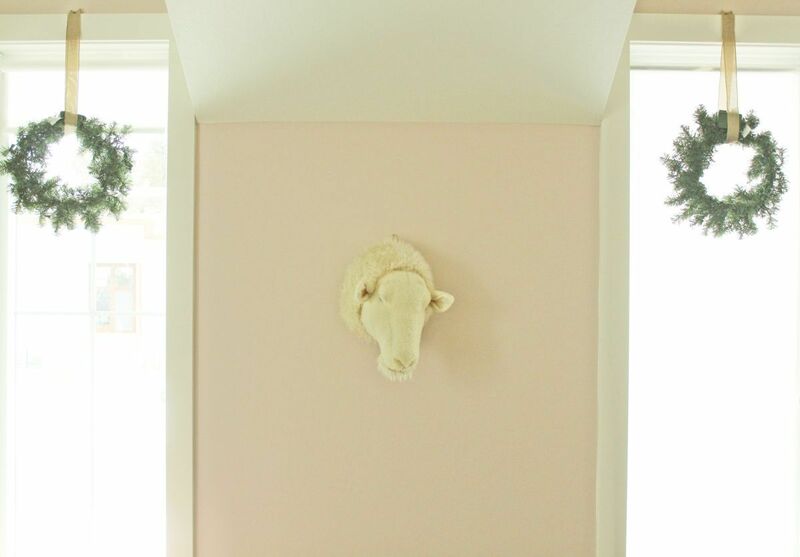 It’s an inexpensive and personalized way to cover a large wall. 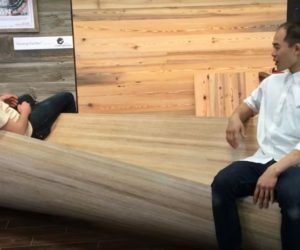 Circle mirrors are hot right now, but that doesn’t mean they are as common as 90-degree angles on a large wall. 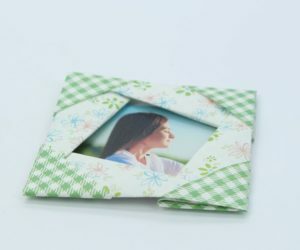 This makes them a great addition to the décor of a large wall. 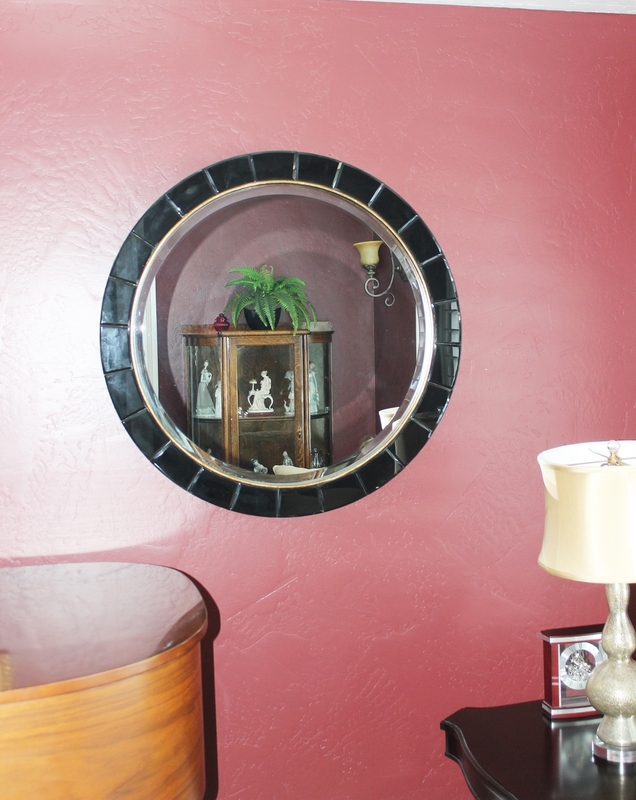 Showcase the distinctness of the circular shape by keeping other décor on the wall absent or at a minimum, and keep the circle in proportion to the wall size itself for best first impressions. 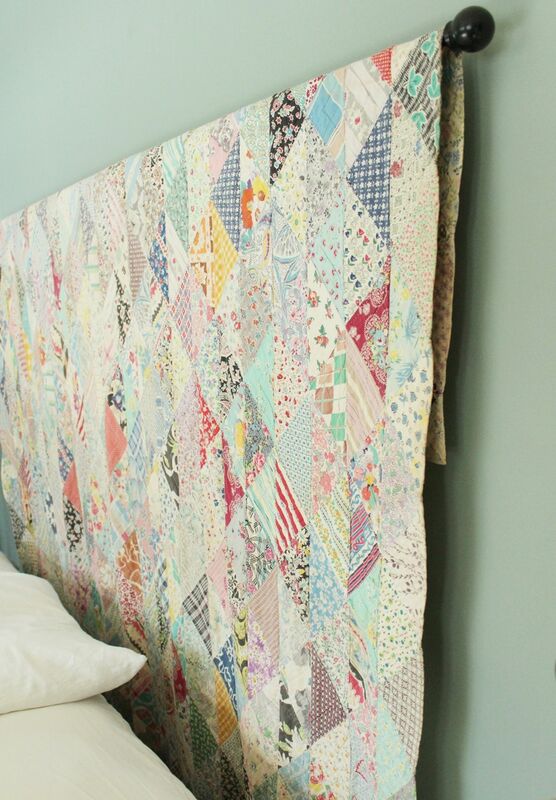 If you’re a world traveler, if you have a beautiful and/or sentimental keepsake quilt, or if you simply found a great piece that would look awesome in your space and you want to show it off, consider this creative idea: hang the piece on your large wall from a curtain rod. It immediately looks artsy, warm, and friendly, all at the same time. 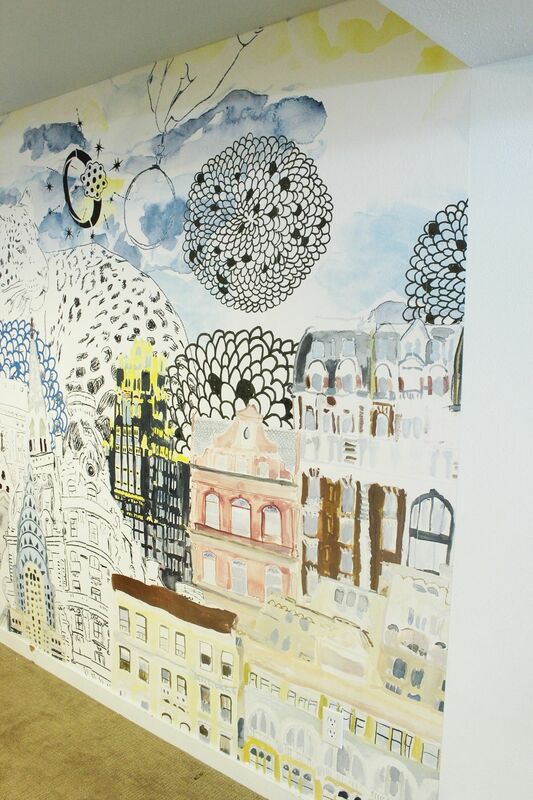 Wallpaper is a simple and gorgeous way to literally cover the large wall and turn it, instead, into a showstopper. 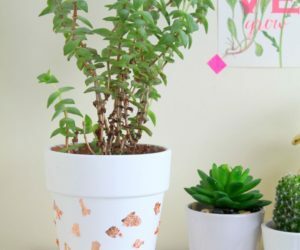 Wallpaper with a great pattern or print would look great, depending on your space, or there are plenty of wallpaper mural options for a slightly more urban twist in décor. 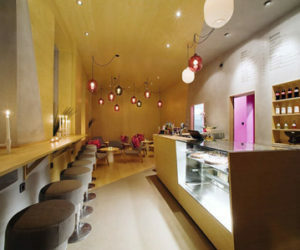 Either way, the result is modern and chic. 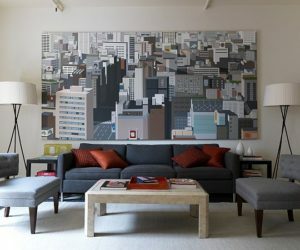 Keeping proportions in mind, consider painting big chunky stripes horizontally on your large wall. 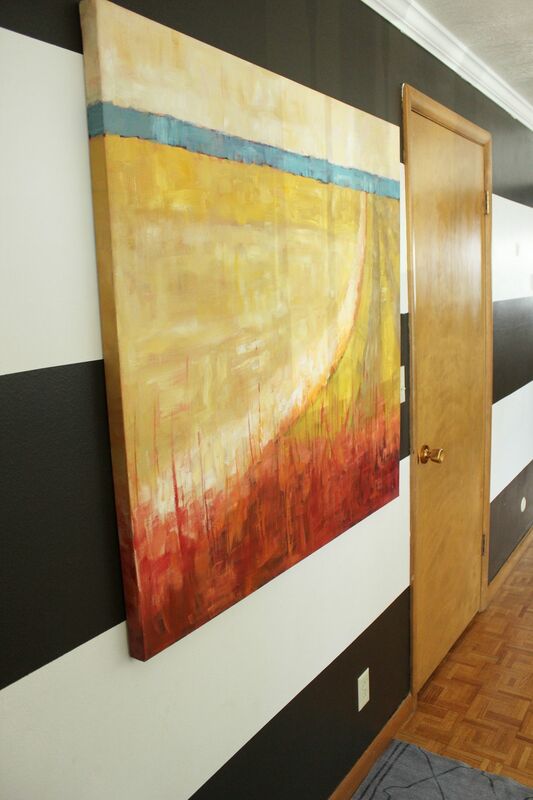 You could let the stripes stand alone as the wall décor, or you could add depth by hanging artwork over top of them. 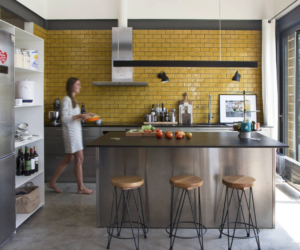 For a subtler stripe option, you could keep the same paint color but vary the sheen instead (matte and high gloss, for example). 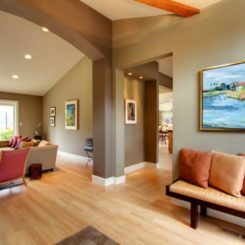 While many of us focus on how to decorate the large wall itself, it’s refreshing to consider that you could perhaps leave the wall alone and decorate a small section of nearby floor. 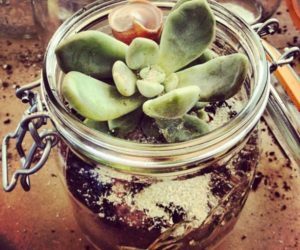 Lean a few pieces in frames, display some branches or grasses in a beautiful pot, and you’ve got yourself a nicely decorated corner of the large wall…which might be all you actually need. 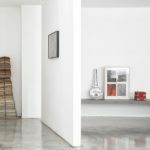 For the collector of beautiful things, a large, blank wall probably feels like a gift, because it provides an obvious and perfect home for your collection. 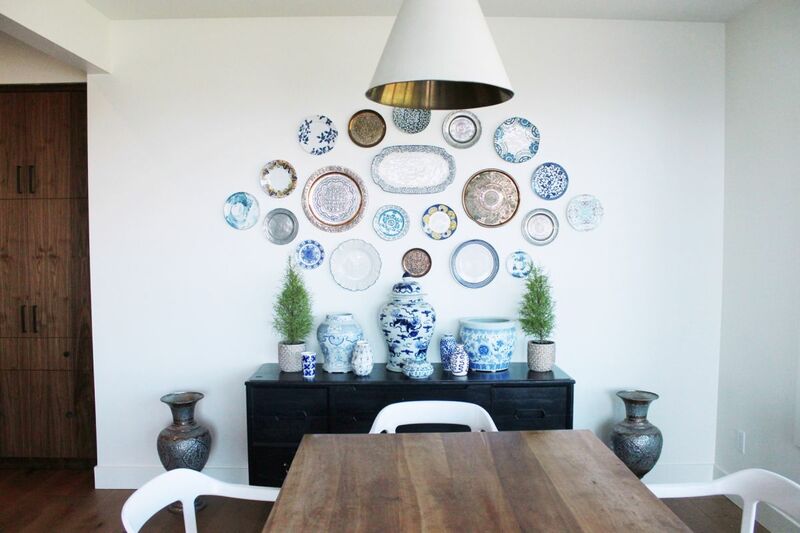 These blue and white china plates, in varied shapes and sizes and even slightly color, are mounted in a decorative configuration with the perfect amount of white space. 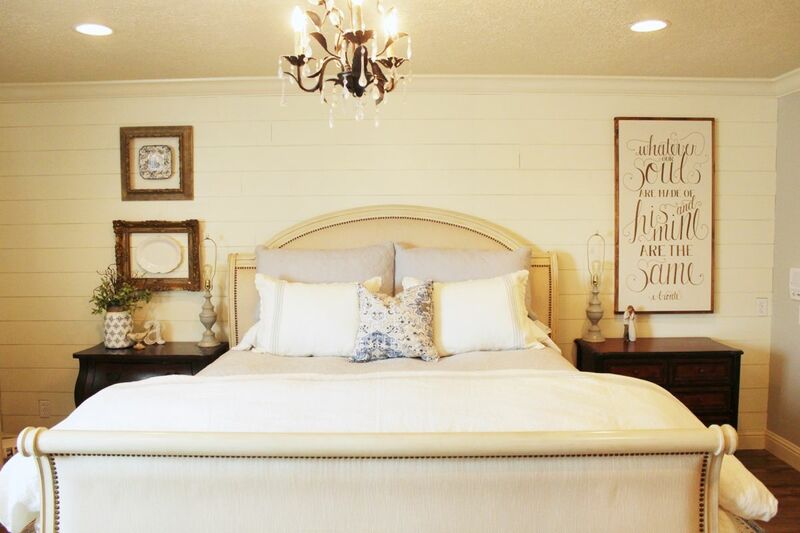 Treat your bed’s headboard as part of the large wall, and add a little décor on either side of the headboard near the nightstands. 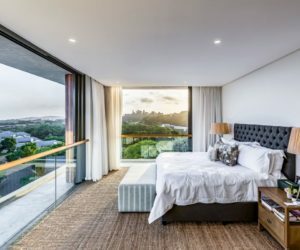 This is a balanced approach that retains the sanctuary vibe of a serene bedroom space.